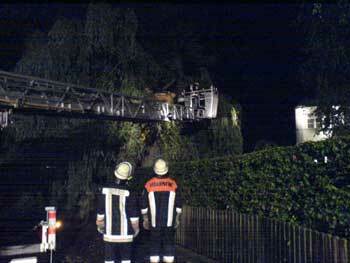 In the evening hours of 07/29/2005 there were severe thunderstorms in and around Nittenau. 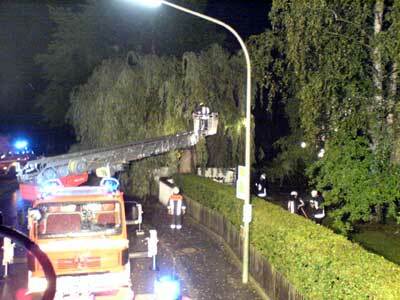 VFD Nittenau got its first alarm at 09.51 p m for removing a tree that had fallen on a street. From this first alarm until about 01.15 a m the Nittenau firefighters had to deal with 8 incidents. These pictures were taken at a major street in Nittenau, where a large tree that was partially broken, had to be removed. 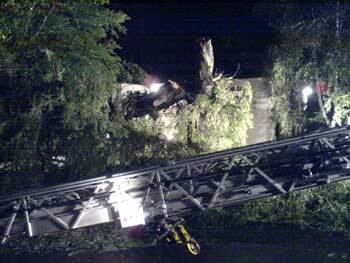 Most of the difficult chainsaw work had to be done from the VFD Nittenau ladder basket.